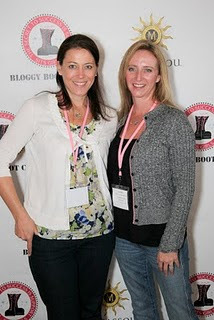 On Saturday I had the opportunity to attend Bloggy Boot Camp in San Diego. Put on by Tiffany and Francesca of SITS girls, it was an amazing experience. I found myself in the company of unbelievably talented, supportive women and came away with so much information, creative ideas and connections that it is difficult to capture it all in writing, and I’m rarely at a loss for words. As Tiffany said, “Everyone deserves to be here” and it was true, everyone made me feel welcome, everyone had their own unique story and everyone had so much to offer each other. Those that know me know I am not a wallflower but like many people, I don’t enjoy talking about myself unless I’ve had several glasses of mommy juice. Coupled with the fact that this was my first time attending anything like this, I was nervous. Luckily for me, my wonderful friend Tonya (Letters for Lucas) shared a post about tips for attending your first conference. So I followed all of them, except maybe the most important one. The part about showing up bright-eyed and rested. We took my dad out for his 70th birthday the night before and I may have imbibed a bit too much in the celebratory vino. Needless to say, 5:30 am arrived earlier than expected. Thankfully I carpooled with Tonya and although I shudder to think how much of an imbecile I came across all tongue-tied on Mama Mary’s handy flip video, I otherwise did my best to rally, though maybe was not as talkative as I would normally be. In just one day, BBCSD helped me solidify what it is that I like about my own writing and why I write, and gave me insight about my blog; tweaks I should make (first things first, I’ve already got my new domain name and am migrating to wordpress – blogspot be gone) and what the future could hold (I had no idea how many stats you could track and how much your blog could do for you) but most importantly, I met new people and put faces to names of the women in my momtourage blogging community that I follow and who inspire me daily. I would be remiss not to mention how pretty Tiffany is, how meeting Mama Kat completely made my day, the great sponsors and the groovy swag (I’ve been married for almost 11 years and my husband was stoked to replace our aging kitchen gadgets – goodcookbrand rocks), how cool it was that Mama Mary said I looked familiar (from my Twitter picture), how excited my 4 yr old son was to see a picture of mommy with Hop, and how thankful I always am for being able to spend quality time with Tonya. I know I’m forgetting to mention someone or something and I apologize for not being able to capture it all. If you have the opportunity to attend a Bloggy Boot Camp, do it, you will not regret it. I laughed, I learned, I went home inspired.